My name is Shadow (“Shadow of Light”). My name comes from Psalm 91:1 which says, “Whoever dwells in the shelter of the Most High will rest in the shadow of the Almighty.” I am a black and white Racking Horse. I am gaited which makes me smooth to ride. I have been a part of Gail’s family since I was 1 year old and I will be 22 this year (born 1993). I was the first horse in the Rising Hope Farms herd which makes me the boss. I am still in charge of most of the herd at the farm despite my age. Though, I have begun to hand the job over to my buddy Prophet. The volunteers here say I can sometimes be lazy, but it is just because I know my job so well. I take special care of each rider that sits on my back and I especially love it when the children feed me treats and brush my coat. My name is Prophet (“True Prophet”). My name comes from Luke 7:16 where it says, “They were all filled with awe and praised God. ‘A great prophet has appeared among us,’ they said. ‘God has come to help his people.’” I am a tri-colored Racking Horse. I have a smooth gait called a rack which allows my riders to go fast without bouncing. 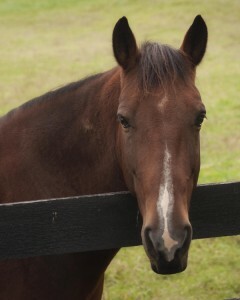 I am one of the younger horses at about 12 years old (born approx. 2003). My previous owners abused me and as a result I can be a little mistrusting of adults, but I completely trust the innocence and love of the special children that come to the farm. I have lots of energy and the volunteers sometimes call me a rascal because I like playing with them when they try and catch me. Shadow is teaching me to be the herd leader and I do more of the job each day. 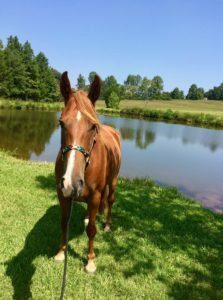 God’s gift of healing has helped me overcome my past abuse and gives me a special connection with my special riders. My name is Miracle. My name comes from Psalm 77:14 where it says, “You are the God who performs miracles; you display your power among the peoples.” I came to the farm in September of 2010. 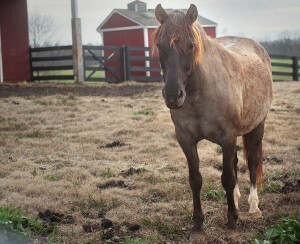 I am a Spanish Mustang and am around 15 years old (born approx. 2000). My coat is a beautiful olive dun color that shines in the summer time. I am the smallest horse on the farm. My small stature helps those that are intimidated by the bigger horses to feel comfortable and safe. Despite my small size, I am very strong and have a wonderfully smooth trot that my riders enjoy. You will often see me with my ears back, but don’t let me fool you. I am not being mean, that’s just what I do. I am feisty and quick, but I know when I have a special child on my back and do my best to protect them. My name is Gideon. My name comes from Judges 6:12 where it says, “When the angel of the Lord appeared to Gideon, he said, ‘The Lord is with you, mighty warrior.’” I was donated to the farm in the March of 2012. 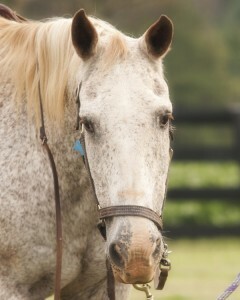 I am an Appaloosa with lots of brown spots all over my body. At around 20 years old (born approx. 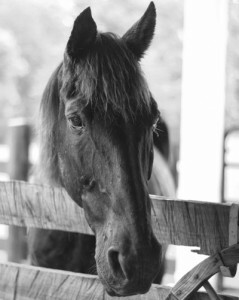 1994) I am one of the more mature and wise horses on the farm. I am considered by many to be the most quiet and reliable horse in the herd. I do not like to rush and will take my time in teaching each child to ride. I love attention, but I will not always seek it out. So you must come to me. I love the children that come to the farm and stand patiently as they get ready to ride. I may not be the biggest horse on the farm, but despite my smaller stature and quiet personality I try hard every day to do my job to the best of my ability. My name is Heaven (“High as the Heavens”). 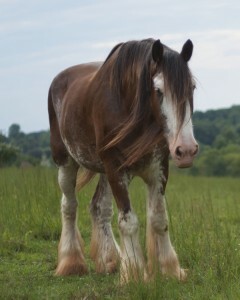 I get my name from Psalm 103:11 which says, “For as high as the heavens are above the earth, so great is his love for those who fear him…” I am a Clydesdale, which means I am a very big horse (the biggest one on the farm). I am used on the farm to pull carts and carriages. The volunteers love to groom me and I love it too. God has given me a majestic gift of size and beauty that is reflected in the wide eyes of children and adults when they see me. I am known around the farm as a “gentle giant” and love having everyone’s attention on me. My best friend is Balaam the donkey. He is never far from my side. We share food and he even hides under me when he is afraid. Like the people in the therapeutic riding program, I too have a special need – I have asthma. It’s difficult for me to breathe sometimes, but the touch of a child can help me relax and soothes my breathing. Hi Everybody! My name is TUG (acronym for “Thanks Unto God”). I have resided at RHF since March. I visited to help out last Fall but decided this was where my home needed to be. A volunteer took me under her wing and has dedicated my services to the special riders at RHF. 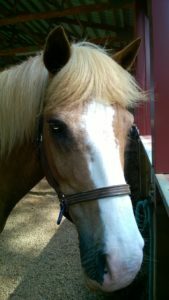 I am a Haflinger/Belgian cross horse with chestnut color and flaxen mane and tail. I am about 16 hands high and 15 years old. I love apples and carrots and give big slobbery kisses. My pasture buddy is Levi. I have been trained to pull a cart but I like my new job working with the wonderful and special riders of RHF! Hi, my name is Gabriel. I picked that name when I heard my human say it for the first time. I pricked my ears, nodded my head, and nudged her shoulder, so she would know that’s what I wanted to be called. It means “God is my strength” in Hebrew. Gabriel was the archangel who appeared to Mary and announced Jesus’ birth (Luke 1:26). All the volunteers call me Gabe for short. 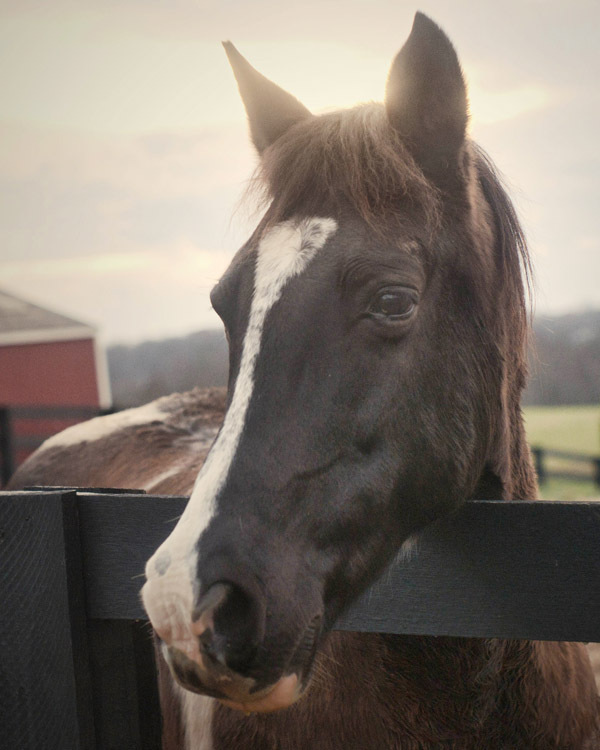 In 2014, we lost one of the special members of our farm team, Abraham (Abe). Abe joined Rising Hope Farms in the second year of the ministry. His majestic stature and kind heart caused everyone to take notice of him. There was not a doubt that God would use him to reflect His love and kindness. He served the farm well until age and crippled legs made it so he could no longer carry the special riders. Yet even then he continued to serve by allowing children and adults alike to groom and love on him. Abe’s quiet and kind personality made it impossible for you not to fall in love with him from the time you met. One of the greatest lessons Abe taught us was that despite struggles and disabilities we may face in our lives, God can still use us to make a difference in those we encounter every day.